1. "we had two children; the oldest one was at the death of its mother about five years old, and the youngest fifteen months; the little girl died last fall" [Jesse Foulke testimony]. 2. "By the first marriage [Lucetta Carlisle] there were two children: Alice, born July 12, 1868, died August 19 1874; Charles W., born August 14, 1871, married Daisy Hutton, September 26, 1897." 1. "Foulk, Amasa J Lucretta Carlisle 1 Aug 1868 Book B, page 304"
2. "My wife and I live together five years before she was killed"
1. "By the first marriage [Lucetta Carlisle] there were two children: Alice, born July 12, 1868, died August 19 1874; Charles W., born August 14, 1871, married Daisy Hutton, September 26, 1897." 1. "was in the baker business in Tipton; kept grocery for some time in Tipton, and at times worked as carpenter trade" [Jesse Foulke testimony]. 1. "Had lived at our house since Sept 15 "
1. "Amasa had lived on that place about two or three weeks"
1. "On the night of November 16, 1873, at the country home between Cicero and Sheridan, a few miles north of Deming, Mrs. Lucetta Foulke [ID0098], while sleeping between her two small children, was shot through the breast and mortally wounded. She lingered some hours, suffering intensely, until relieved by death." 1. "He married third, Elizabeth Lee Grant, February 27 1890. They reside at Lewisville, Nebraska." A William Foulke is listed on the Census of 1870 for the Ioway Nation in Iowa - .doc file - Could this be Amasa's brother William? -- Amasa J Foulke lived in Marshall County, Iowa in the 1880 US Census - Was he living with or near his brother? S2 Book, Index to Marriage Records Hamilton County 1850-1879, Vol 1. Ind WPA, 1942. S3 Newspaper Article, Noblesville Ledger, 12 Feb 1875, page 1, Amasa J Foulke testimony. Noblesville, Hamilton County, Indiana. Acc000889. 1. "My wife and I live together five years before she was killed"
2. "Have lived in house where murder occurred before going to Tipton". "Came from Tipton; had lived at Tipton about 1-1/2 years." [Jesse Foulke testimony]. S6 Book: John F Haines, History of Hamilton County, Indiana..... (Indianapolis, Indiana: B. F. Bowen, 1915), page 395. Bk2922. S7 Book: Harry Fred Lancaster, The Lancaster Family: A History of Thomas and Phebe Lancaster of Bucks County, Pennsylvania (Huntington, Indiana: A J Hoover Printing Company, 1902, Bk2930), page 236. 1. "He married third, Elizabeth Lee Grant, February 27, 1890. They reside at Lewisville, Nebraska." 3. "He married third, Elizabeth Lee Grant, February 27, 1890. They reside at Lewisville, Nebraska." 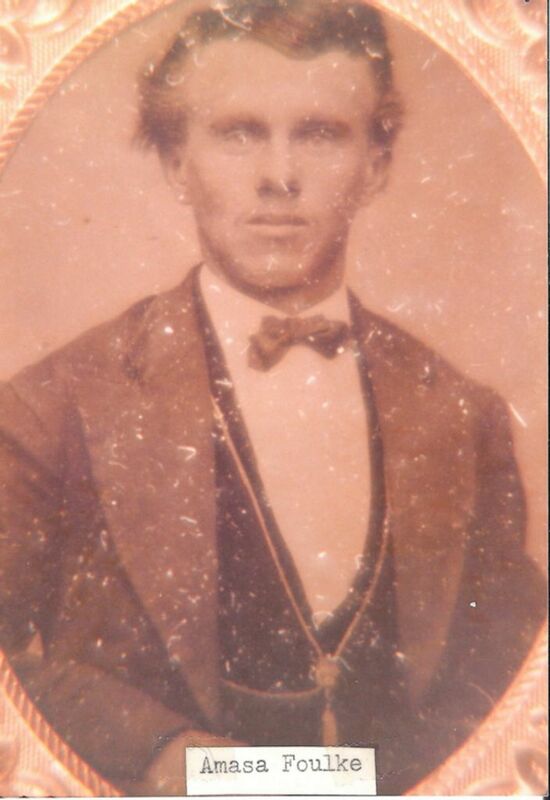 1] Amasa Foulke - Head - 49 yr old white male, born Aug 1850, married 10 years. Born in Indiana - both parents born in Ohio - Occupation is carpenter - can read, write and speak English - They rent their house. S10 1910 Federal Census, Oklahoma City, Oklahoma County, Oklahoma. SD 2, ED 215, Sheet 15A, , South Lee St, Family 329, Line 31, Amasa J Foulk. Original Data: NARA, T624, Roll 1266. www.ancestry.com , Accessed 14 Feb 2009. Acc001559/Ph6872.jpg. 1] Amasa J. Foulk - Head - 59 yr old white male, married for 20 years to present wife - He and both his parents born in Ohio. Able to speak, read and write English - Occupation is Contractor - Retired - He owns his house with a mortgage. 1] Amasa J. Foulk - Head - Own Home with Mortgage - 71 yr old white male, married - Can read and write and speak English - he and his parents born in Ohio. He is a house carpenter and is a worker. 2] Lizzie L. Foulk is a 52 yr old white female who is married and is wife of the head - she was born in West Virginia and her father was born in Pennsylvania and her mother in West Virginia. She is able to read, write and speak English - no occupation. S12 Newspaper Article, Noblesville Ledger, 19 Feb 1875, page 3. 1. "His little daughter was sick a good deal of the time. I was frequently at his house" [Dr Martin Van Buren Newcomer testimony]. 2. "They went to Tipton in 1871" [George Foulke testimony] == "Defendant moved from Tipton the latter part of Sept before the death of his wife." [Robert W Wright testimony]. 1] Jesse M. Foulke: Head of household, 45 yr old male, Farmer, Real Estate Value: $2200, born Pennsylvania. 2] Mary Foulke: 36 yr old female born in Pennsylvania. 3] John Foulke: 6 yr old male. 4] George Foulke: 5 yr old male. 5] Meary A. Foulke: 4 yr old Female. 6] William Foulke: 3 yr old male. 7] Amasa Foulke: 1 yr old Male. S15 Newspaper Article, Noblesville Ledger, 12 Feb 1875, page 1, Jesse Foulke testimony. Acc000889. 1. "Have lived in house where murder occurred before going to Tipton". Amasa Foulke of Oklahoma City, brother of George and John Foulke reached here a few hours too late to see his brother George alive. 1. Place of Death: Dist. No. 1903 County of Los Angeles Town of Long Beach/ Street No. 1232 Hellman St.
2. Full Name: Amasa Foulke/ Residence No. 1232 Hellman St.
17. Length of Residence: District of Death: 8 yrs. - In California: 8 yrs. Funeral Director: J. J. Mottell, Inc., Long Beach, Calif.
21. Filed Apr 9 1934 by S. G. Arnold M. D.
23. Medical Certificate of Death: I hereby certify that I attended Deceased from Feb. 2 1934 to April 7 1934. That I last saw him alive on 7 Apr 1934 and that death occurred on the above stated date at the hour of 1PM. 27. Signature: [typed] Ernest F. Green, M.D., Seal Beach, Calif.
S23 1870 US Census, Clay Township, Wood County West Virginia, page 1A, Line 13, Dwelling & Family 4, D. C. Grant Household. Original Data, NARA: M593_1702; Family History Library Film: 553201. www.ancestry.com, accessed 21 Dec 2013. Acc003084. S24 1850 US Census, Franklin Township, Wayne County, Indiana, Page 254A, Line 22, Dwelling & Family 47, Thomas Carlisle Household. Original Data, NARA: M432_180. www.ancestry.com, accessed 21 Dec 2013. Acc003081. S25 1860 US Census, New Garden Township, Wayne County, Indiana, page 85A, Line 16, Dwelling 593, Family 604, Thomas I. Carlysle Household. Original Data, NARA: M653_308; Family History Library Film: 803308. www.ancestry.com, accessed 21 Dec 2013. Acc003082. S26 Database On-line, Amasa J. Foulk and Lizzie Grant. "Nebraska, Marriages, 1855-1995," index, FamilySearch , accessed 30 Mar 2014), Amasa J. Foulk and Lizzie Grant, 27 Feb 1890; citing , Douglas, Nebraska, reference ; FHL microfilm 870045 and 870045 . Amasa Foulke, of Lincoln Nebraska, came back to Hamilton County to attend the funeral of his mother, Mrs. Jesse Foulke. Mrs. John Eveleth received word of the death of her uncle Amasa Foulke, at his home in Los Angeles, Cal., Sunday April 8th. 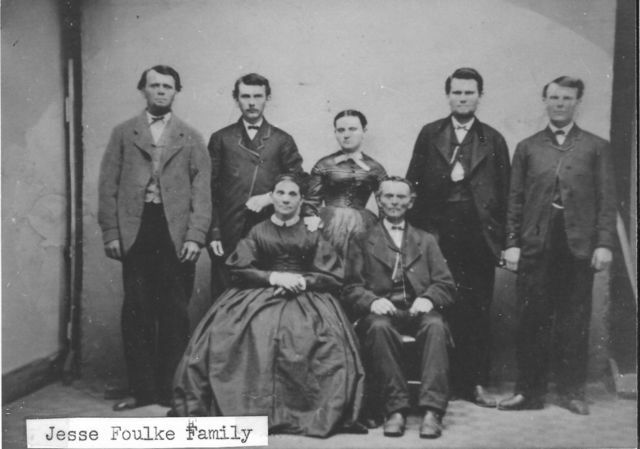 Mr. Foulke was born and reared in Hamilton county, the youngest son of Mr. and Mrs. Jesse Foulke. Other departed members of this family are J. B. Foulke, George Foulke, Will Foulke and Sarah A. McShane. Mr. Foulke has been in declining health for several months. He leaves a wife, Elizabeth Foulke. There are a number of relatives and friends in this county. The interment took place at Los Angeles. Amesy [Amasa] Foulke, of Oklahoma City, is visiting his brothers, John and George Foulke, and other relatives. Joshua Jones vs Amasa Foulke and George Foulke, judgment for plaintiff for $11.87. S31 Marriage Record, "Ohio, County Marriages, 1789-2013," database with images, FamilySearch ( https://familysearch.org/ark:/61903/1:1:2Q3K-DD6 : 7 March 2018), Amasa J Foulk and Belle Linder, 30 Aug 1877; citing Warren, Ohio, United States, reference ; county courthouses, Ohio; FHL microfilm 964,266. Doc4677.pdf. You are hereby authorized to Join in the Holy Bonds of Matrimony, and to celebrate within this County, the rites and ceremonies of Marriage between Mr. Amasa J. Foulk of Omaha aged 34 born at Ohio son of J. Foulk his mother's maiden name Mary Baker, and M Lizzie Grant of Lincoln aged 22 years, born at Va. daughter of David Grant her mother's maiden name was Sarah Prince and this shall be your good and sufficient warrant, and you are required to return this License to me within three months from the celebration of such Marriage, with the Certificate of the same appended thereto, and signed by you, under the penalty of five hundred dollars. [L.S.] In Witness Whereof, I have hereunto set my hand and official seal this 27 day of Feb. A. D. 1890 G. W. Shields, County Judge. 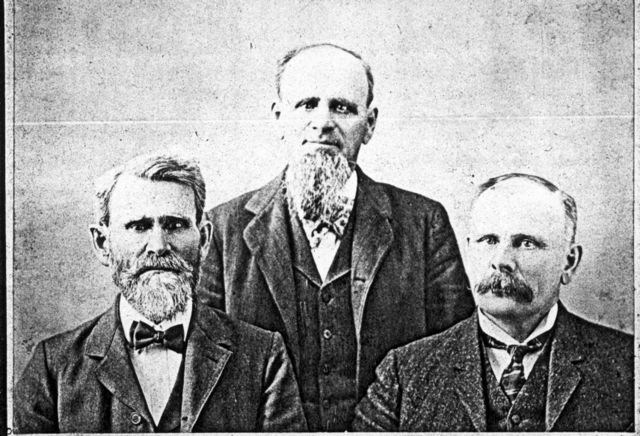 Be it remembered, that at Omaha in said County, on the 27 day of Feb. 1890 Mr. Amasa J. Foulk and Miss Lizzie Grant were duly Joined in Marriage by me in presence of Thomas Murphey residing at Omaha and E. F. Morearty residing at Omaha witnesses present at the Ceremony. G W. Shields, County Judge.